As someone who’s on the go quite often, my Switch is often my preferred console. (Though if you can find a way to fit a PlayStation 4 in your coat pocket, I’m all ears!) That said, one of the design flaws of the Switch’s handheld mode is the middling battery life, which lasts me anywhere from two to four hours on a full charge. While it’s fine if I’m at a place that has electrical outlets, I’m out of luck if there is not reliable power source around. So portable charging solutions are the next best thing. The RAVpower Xreme 26800mAh Power Bank is a fine way to get some extra juice into your USB-powered devices, and while it’s a bit on the heavy side, it can be a great purchase for those who are out and about regularly. What’s included with the package. Right out the gate, the RAVpower Xtreme 26800mAh Power Bank comes pre-charged and ready to go with three USB ports available to charge your devices. The charger I was sent did not have any USB-C ports, and only included two micro-USB cables (a short and long one, which can be used to charge the device itself as well). The addition of two cables is one that was surprising considering the other portable chargers I’ve bought recently only had one cable. However, it would have been nice to include a USB-C cable as well as a micro-USB at the very least. As you can see, the RAVpower Xtreme 26800mAh Power Bank is hefty and weighty; for comparison, I set it next to an Anker Powercore 5000 and Aukey 10000 Slimline. The RAVpower battery towered over the two chargers, and feels more like a laptop battery brick at times. This does increase the durability of the charger, though I did prefer stowing away my Aukey Slimline in my pocket compared to the RAVpower. 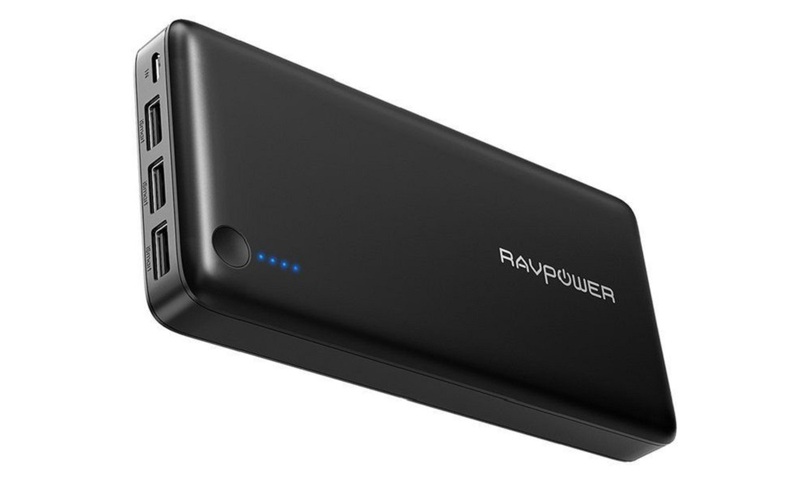 That said, I do recommend putting the RAVPower Power Bank in a backpack or satchel, as the weight is less of an issue there. A lot of cables, but still a happy battery! In nearly an hour, the former two devices were fully charged, with my Switch reaching 60% battery. All the while, I only spent about 25% of the battery from the RAVpower Power Bank. It keeps its remaining battery charge as well, and I didn’t have to recharge the device for a few days after moderate use. Compare this to my Aukey portable charger, which struggles to charge both my phone and Switch simultaneously, and ends up dying by the time my Switch reaches the 75% mark. For a price point of $60, this is a device that will help you with your portable charging dilemmas. While a bit bulky for pockets, the RAVpower 26800 mAh battery is a great device to carry around for charging of three devices. Its wonderful durability and speedy charging times is a must for Switch gamers on the go, especially for those that want to play all day long.